I started reading Eduardo Galeano's Mirrors two years ago and now, my fifth? sixth? seventh? time start-to-ending it, I don't think I'll ever finish. Three or four of these - what to call them? blurbs? capsules? bullets? punches? - between a heavy dinner's Gass of The Tunnel and the binge eating of Potus, perspective delivered. It's nothing more or less than power's width, length, and depth in all its brutal simple history. I bought an eBook version yesterday so I have it on my phone for daily litany, it occurred to me after I bought it I could post some here as photos snapped on the phone. Do you want them? Won't be everyday, won't be start to finish. If you don't I won't. Also too, remember the radio station I sent email applications to volunteer in the hopes of getting a show? They emailed! We are looking for volunteers to work the door at a long-running (nearly 30 years!) Halloween benefit in Takoma Park on October 29. Here's the Facebook page for the party with more info. This year, proceeds will go to groups includingTakoma Radio, Partners in Health and Nonviolence International. We are looking for energetic people who aren't afraid to ask guests for the $15 - $50 suggested donation at the door.To sign up for a shift, click here. (Volunteers must be 21+.) Volunteers will get to enjoy the party for free when they're not working their shifts! Sorry to meatloaf you, but I would do anything for a radio show, but I won't do that. Hello Tatyana, thank you for the email. I'll be out of town on Halloween weekend (and I'm not a halloweener anyway), but PLEASE send me email the next time you need volunteers or anything. I am very much interested in helping out at the station. Is true - Earthgirl and I will be in Shenandoah for three-day weekend hiking. Is true - I am not a halloweener. I will play Dog Faced Hermans my first show. Beyond the Pipeline: a Statement. Being a bumpkin - three books on poor white Americans. You can't scream fascist (fixed) without consequences. The new US way of war. The rise of Trump bodes the end of the presidential system, for good or bad. Women who hate Trump but aren't with Her. You can't always make yourself happy. at my local library i have requested galeano's mirrors, and also scorcese's documentary about bob dylan, "no direction home"
I'm starting to think you intentionally mis-link to see who's clicking. Tell me I'm wrong. 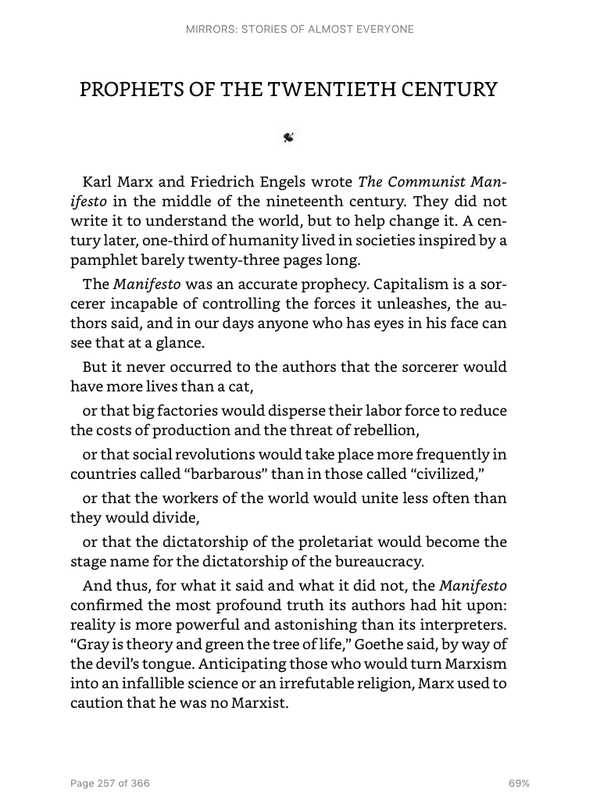 My Class Book Report: Karl Marx and Friedrich Engels wrote The Commie Manifesto because they were looking for energetic people who weren't afraid to ask guests for a $15 - $50 suggested donation. There were also things in the book about cats, barbers, and being civil. Goethe stuck something in there about grey-green stuff, as he usually did, but he was polite about it. Volunteers got to enjoy the Communist party for free when they weren't working their shifts, but after 1991 they had to pay that cover charge. And PTT and PPTT. Because Freedom. 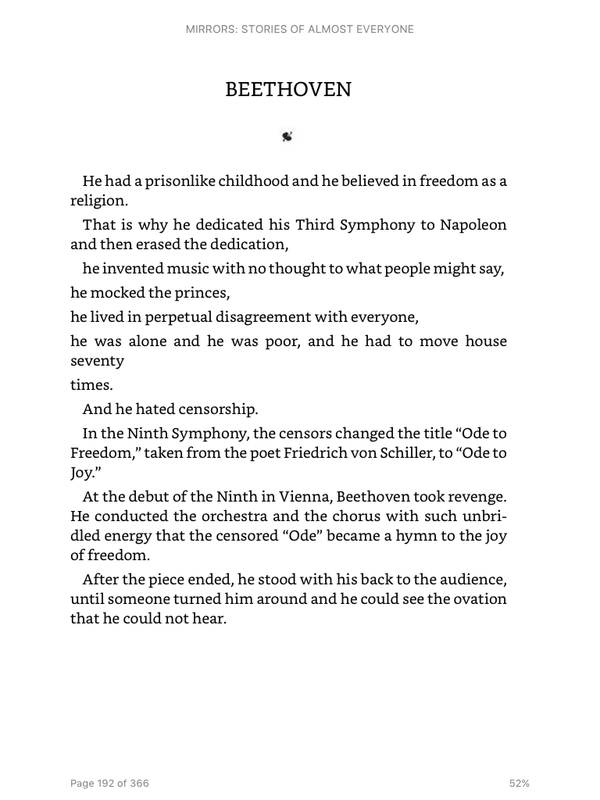 Special Musical Addition: Beethoven invented music in prison. Because freedom. And he did something with mock Princes, or Fake Sovereigns Formerly Known As Princes. That wasn't clear. But he got his revenge by erasing / rubbing out Napoleon in that Vienna. Afterwards he was all turned around, to a big ovation. Yay! I spoke up too late. I like the Galeano. I'll keep it in mind next time I get to a used book store. Thanks as always my generous and most erudite friend.